Next year is the 800th anniversary of Magna Carta. Calls for a constitutional convention have now reached parliament. OurKingdom, IPPR, the politics departments of Oxford and Cambridge will together be hosting the Great Charter Debate - what would a new Magna Carta say, and what could a new constitutional settlement for Britain look like? 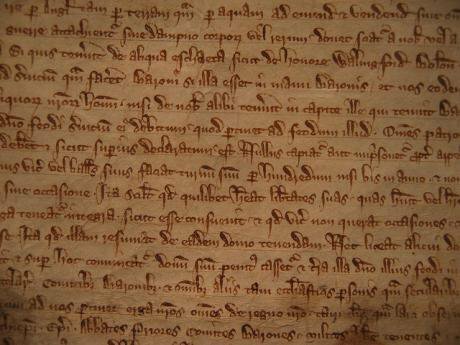 15 June 2015 marks the 800th anniversary of the signing of Magna Carta. How should we commemorate this? The historical reality of Magna Carta is complex. We tend to overlook the accompanying Charter of the Forest which reinstated popular rights to the commons. As a national myth, however, Magna Carta is understood as a key moment in which arbitrary power was held to account and robustly limited. Power is arbitrary when those who wield it can do so at their will, without proper accountability to those subject to this will. Freedom can be understood as the status one has when one is not subject to another’s will in this way, when one is not living ‘at the mercy of another’. So the upcoming anniversary is an opportunity to ask: Where does arbitrary power lie in our society today? How can we effectively contest and contain it? How can we be free? Parliament has invited us to approach the anniversary in this spirit. In July 2014, the Political and Constitutional Reform Select Committee, chaired by Graham Allen, launched its report, A new Magna Carta? Rather than simply prescribing a constitution, the Allen report sets out some options and invites us to join in a consultation on the way forward. But we must approach the anniversary in a questioning spirit for another reason. Scotland’s independence referendum in September 2014 has shaken the British state to its foundations. Whatever one’s position on the referendum, it has done three noteworthy things. First, it has generated an exceptional level of political engagement and deliberation in Scotland, an all too rare experience in contemporary politics of ‘deliberative democracy’. Second, it has highlighted more than ever the severe underlying problems of the British state, steadily eating away at its legitimacy: the lack of devolution to and within England; the state’s apparent lack of responsiveness to major social problems; the perception many have that politics serves a narrow elite at the expense of the wider society; the lack of trust in elected politicians, to name but some of the issues. Third, it has also precipitated—and ought to precipitate—some serious self-questioning in England of Englishness. By calling ‘Britain’ into question, the prospect of Scotland leaving the UK has unsettled existing notions of Englishness. If England gets some form of devolution in a post-referendum settlement, then this, too, will force the question of what it means to be English. Can we build on the energy of the Scottish independence debate, carrying it forward into a UK-wide deliberation that constructively addresses both Britain’s crisis of legitimacy and England’s emerging crisis of identity? Such a process must have the time it needs for citizens to engage and organise. As Rebecca Johnson and Rupert Read argue, it must be inclusive and participatory, going well beyond professional politicians and political parties to include civil society groups, newly emerging networks and people far too often left out of public discourse and decision-making. It must be open and encompassing, taking on questions of rights and liberties as wide-ranging as people wish. Concretely, the questions are multiple. If there is greater devolution to Scotland, as the unionist parties have vowed, should England have its own parliament? Should England have regional assemblies? City devolution? Should there be ‘English votes for English laws’? But adequate attention to our fundamental liberty requires that we consider these important questions alongside many others, including: What protections should citizens have against the state’s new powers of electronic surveillance? Do citizens have adequate rights to public assembly, protest and expression? Do corporations have too much power in the political process and, if so, how can this be checked? How is liberty affected by factors such as race, gender, and disability? Or by inequalities of wealth? What new rights—civil, political and economic—can help to secure a more effective and equal liberty? What are the pros and cons of a written constitution? Over the coming year, the Great Charter Debate will publish articles to foster and support a democratic deliberation on these and related questions. At its centre stands an editorial partnership which currently includes OurKingdom, the UK section of openDemocracy; Politics in Spires, the blog of the Departments of Politics at Oxford and Cambridge Universities; and the Institute for Public Policy Research. We will seek to develop a wider network of partners as we aim to encourage a debate that goes well beyond academia and think-tanks. We will begin with responses to the Allen committee’s consultation. We will continue into 2015 as the debate over the future of the UK develops in the aftermath of Scotland’s independence referendum. Throughout, we will keep as our central focus the fundamental question: Where does arbitrary power lie today - and how can we contest and contain it? We invite you to join us and to help to make this a Great Charter Debate. If you want to support this project, you can donate to OurKingdom here to help keep us producing independent journalism. Thank you.